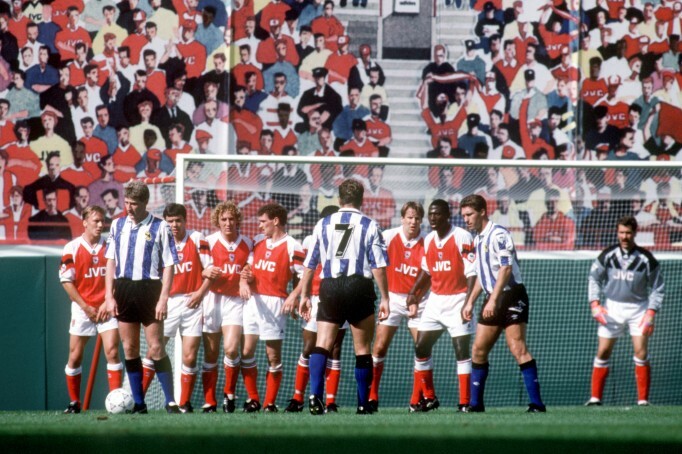 On this day in 1992, the controversial ‘Highbury mural’ was unveiled for its first competitive game at the Arsenal Stadium. That summer, the ‘North Bank’ terrace had been demolished to make way for a new all-seat stand, and a giant mural was created to hide the construction site. The mural depicted thousands of supporters, but it was criticised for not including enough black people (Arsenal had more black fans than any other English club). The painting was duly amended to reflect this. It was then pointed out that some children were depicted next to adults who did not appear to be their parents. This prompted criticism from children’s charities (who thought it irresponsible to put children next to strangers) and adoption organisations (who objected that these children would not have been placed with foster parents of different races). All children were consequently painted the same colour as the nearest adult. It was then pointed out that none of the children were sitting next to women, and that women were under-represented overall. One thousand women were added, included several hundred in saris, burkas, and traditional African headgear. Four nuns were placed in the top left-hand corner, one of whom was struck in the face by a clearance from Lee Dixon in the first match. Fifty male Sikhs were also added, some with ceremonial swords, which were then removed on police advice. It was subsequently rumoured that the picture was altered again, after gay rights groups claimed that not enough homosexuals were included. Although no such thing had happened, there were nevertheless complaints that homosexuals had been put next to women and children. The club, in conjunction with gay organisations, released a statement saying that no such alterations had occurred, that gays look no different to anyone else, don’t need to be depicted in any special way, and are no threat to women or children at football matches or anywhere else. The mural was demolished the following year. Written content © Barrett's On This Day. This site is a work of fiction. Don't believe a word of it.